The case of the smuggled Ban Chiang artefacts unearthed earlier this month in California has far-reaching consequences for museums and industry in the US. 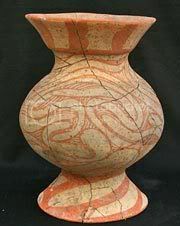 12 October 2007 (The Inquirer) – Could Philippine antiquities by sold off illegally on eBay? Very recently, the Greco Shipwreck Artifact Auction was a 2,500 lot auction consisting of various Asian antiquities supposedly found in the waters of Southeast Asia. The name behind the seller rings very familiar to one Philip Greco, who, if you search this site was mired in some controversy in 2005 when he got into some trouble with the Malaysian government over antiquities shipping. The article never establishes if the Greco in the eBay auction is the same Greco who got into trouble with Malaysia. SEAArch does not condone the selling of antiquities by treasure hunters. Is Greco still selling off our heritage? These items are part of a large collection called the â€œGreco Shipwreck Artifact Auctionâ€ that include priceless funerary urns and white wares from the Sung and Yuan dynasties (11th to 14th century), blue and white wares from the Ming (15th to 17th century) and Qing (late 17th to early 20th century) dynasties, as well as numerous ceramics from Thai and Vietnamese kilns contemporaneous with the Ming and Qing dynasties. Not only are ceramic wares being auctioned off, bronze items, labeled â€œHan-likeâ€ figures of animals, are also included, probably 12th century copies of early Neolithic bronze decorative arts in China. There is even a wooden â€œlusongâ€ (mortar, no pestle) erroneously labeled â€œPhilippine Tribal Wooden Drum Standâ€! 17 May 2007 (PM) – PM is an afternoon radio news show in Australia. I think the title says it all: it’s alarming to learn that such pieces of Angkor Wat were on eBay for sale. It’s also interesting to note that the seller is based in Thailand and the goods are in Singapore – the two countries in SEA which have not been signatory to the 1970 UNESCO Convention on the Means of Prohibiting and Preventing the Illicit Import, Export and Transfer of Ownership of Cultural Property. The programme talks to people in eBay and Dr. Dougald O’Reilly, the director of Heritage Watch, an NGO based in Cambodia. You can hear the SEAArch podcast with Dr O’Reilly here. MARK COLVIN: Angkor Wat is a huge and ancient city of palaces and temples that rise out of the Cambodian forests and whose history gives it a prised position on the world heritage-list. Now, a vendor on the Internet auction site eBay says you can have your very own piece of it. Invaders and treasure hunters have looted Angkor Wat extensively since the Khmer kings abandoned it hundreds of years ago. Although it’s been illegal to remove relics from Cambodia for the last decade, heritage workers say those laws are very difficult to enforce. TIMOTHY MCDONALD: For just under $6,000 you can have your own relief sculpture or statue to sit on the mantelpiece or next to the water feature in the back yard. There’s just one problem, it’s quite possibly illegal to buy or sell the goods. So eBay immediately started an investigation when PM informed the company about the seller. Read the full story and even listen to the broadcast here.